BuyBaltimoreProperties.com | Step 2: Received Your Pre-Qualified Approval? You’re Almost Done! It’s Application Time! Step 2: Received Your Pre-Qualified Approval? You’re Almost Done! It’s Application Time! We will review your application prior to submitting to the RWFR program to help ensure your approval BEFORE paying the required program fee. The RWFR Program will require a NON-refundable $75.00 Application Fee (for the Household, NOT per person, and is NOT needed to be paid right now). 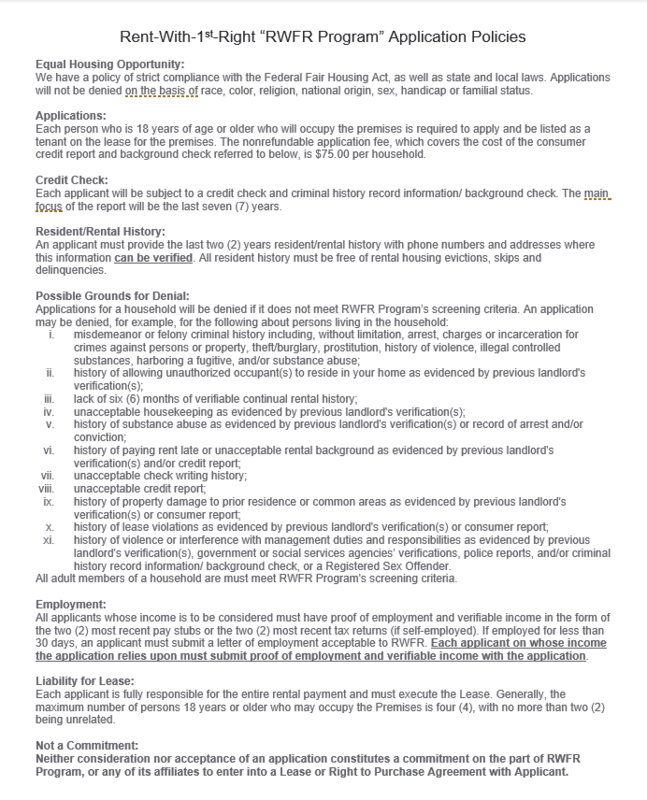 Each Household application requires all Residents over 18 to be included on the Full Application (program processing will include credit history, criminal history and background checks for all Household applicants). 2 Adult Households will only need to submit one (1) application as there are fields for both adults to input their information. For Households with more than 2 adults, the additional adults will need to submit their information in a separate application form submission.